KEEP THE CHANGE: Resplendently bearded Princeton Township Mayor Chad Goerner waiting on his Township Committee colleague Lance Liverman last week at the Alchemist & Barristers ongoing Longbeard Benefit for The Colin Pascik Road to Recovery Fund. Guest bartenders assisting the mayor that night were members of the Township Police Department. 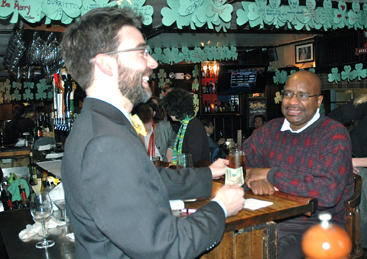 Every Tuesday leading up to the March 17 main event (note the shamrocks), guest bartenders have been mixing the drinks. For more information about The Colin Pascik Road to Recovery Fund visit www.colinpascik.org. For more about beards see this weeks Town Talk. Borough Council last week unanimously introduced the municipalitys 2011 budget, which weighs in at $25,991,953. Administrator Robert Bruschi suggested that Council consider a one-cent tax increase to offset the difference between the rise in expenditures and revenues, but all members of Council endorsed a zero-percent tax increase this year. While the relative merits of consolidation and shared services between the Princetons are being considered, the already consolidated Princeton Regional Health Department is forging connections with other municipalities in the region. Health Officer David Henry reported on the latest happenings in public health at last weeks meeting of Borough Council. Money  with regard to next years budget, pool appropriations, and capital requests  was the theme of Monday nights Township Committee meeting. For Tara Thomas, things didnt start off well this winter in her senior season on the Princeton High girls basketball team. Chief nourisher in lifes feast. So wrote William Shakespeare in Macbeth, and many people today can identify with the thoughts expressed. More people than ever complain of being sleep-deprived in our high tech, demanding, and constantly connected society. And, now, in addition to not having time to get enough sleep, increasing numbers of people are being diagnosed with Obstructive Sleep Apnea (OSA).